The name of Japanese indie developer Poisoft should be familiar to Nintendo fans, as they were behind Kersploosh!, one of the 3DS eShop’s earliest titles. The game’s premise was nothing extraordinary, as players just controlled an object as it fell down a well, but the game offered up a thrilling high-score chase. 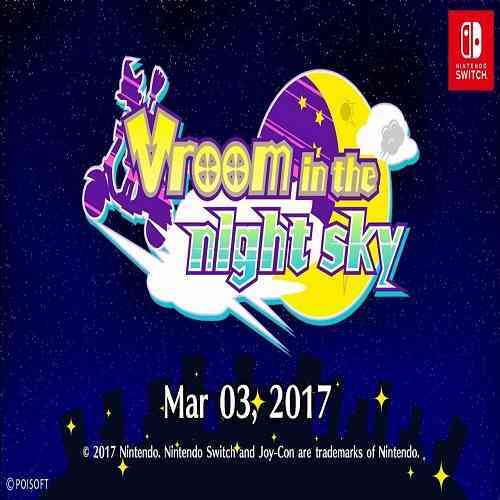 Now the developer is attempting to strike the same magic on the Switch with Vroom in the Night Sky. 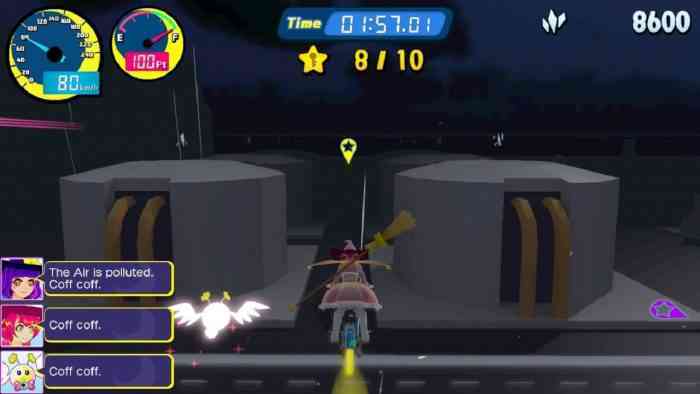 In Vroom, players control a bike-riding witch with the goal of going through a series of rings, and then heading to the exit. The idea of a free-form checkpoint race against the clock seems fun in concept, but sadly the initial bike in Vroom moves at a ridiculously slow speed. This doesn’t give the player the thrill of flying through the air, but instead manages to make the player feel as if they were slogging their way through sludge at a snail’s pace. Perhaps a slow afternoon drive on a flying bike would be peaceful if the game’s simple-looking environment wasn’t constantly popping into view, but my early moments had me wondering what I had gotten myself into. Thankfully, things get a little better once the player has access to faster bikes, but that’s when the game’s lack of structure really becomes noticeable. The only goal for each level is to finish it as fast as possible, which makes collecting Stardust (the game’s in-game currency) a questionable choice as it only results in a worse time. It’s not that the time really matters, though, as there’s no sort of real ranking system, and the player isn’t really given a goal to beat. Since there’s nothing to really do inside the levels besides flying to the marked targets, and there really is no incentive to get a great time, it makes the game feel excruciatingly boring. 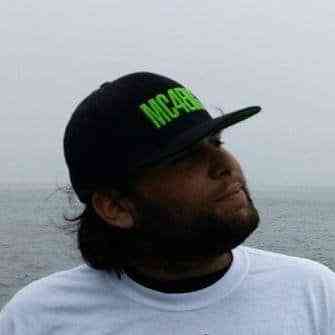 No matter if I was flying around a resort town or high in the sky surrounded by airplanes, my pulse remained as calm as possible. It doesn’t help that the game’s initial set of five levels can be completed in about 10 minutes. This meant that I spent an hour replaying the same stages ad nauseum in order to grind out currency, so I could buy the bikes that unlocked the final three stages. 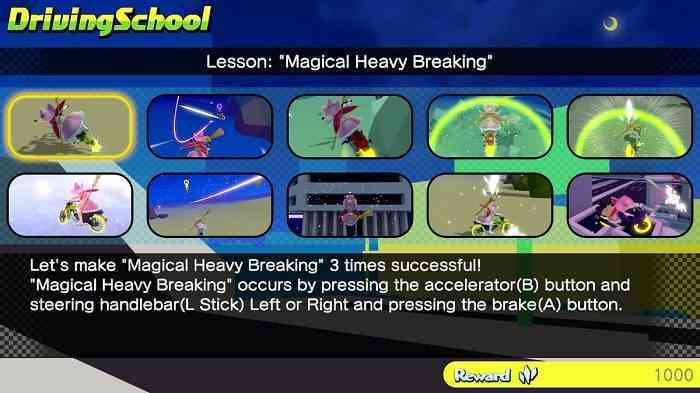 During my grinding, I eventually ended up doing the in-game Driving School, a separate mode that shows the players some advanced techniques. It was here that I realized that the game had a lot more depth than I had initially given it credit for, as I could make my witch do backflips in the air in order to avoid objects, shoot rockets that could collect nearby Stardust, and even do a crazy trampoline flip. These mechanics are really cool, and the Driving School is worth doing simply because it’s the fastest way to get money in-game, but I quickly found out that there wasn’t any good reason for me to use these skills when going for the fastest time. If this was Tony Hawk’s Pro Skater, or if there was a separate high-score for tricks, then sure, but these risky maneuvers only served to slow me down for the most part. That’s just one of many poorly written lines of dialogue in the game. 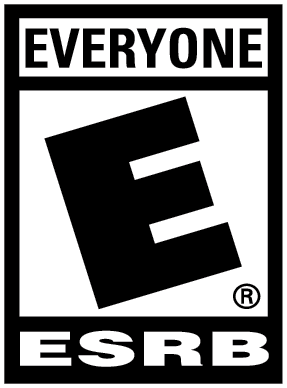 While I don’t want to spin the horribly bad localization as a positive, it was the only thing that kept me entertained while playing. I found myself chuckling aloud when the protagonist would randomly ask “do Magic Bike get rusty in sea breeze?” and I was excited whenever I saw new dialogue popping up in the bottom left corner of the screen. This terrible translation gives Vroom a certain unintentional charm, and not unlike a b-movie it’s ultimately better off for it. The fact that there are some­ interesting mechanics trapped beneath the monotonous grind called Vroom makes it all the more disappointing. Poisoft has shown the ability to create fun portable experiences in the past, but all of the trappings that would normally keep players coming back are missing here. With little to offer other than some unintentionally hilarious dialogue exchanges, Vroom in the Night Sky is best avoided on the Switch eShop.